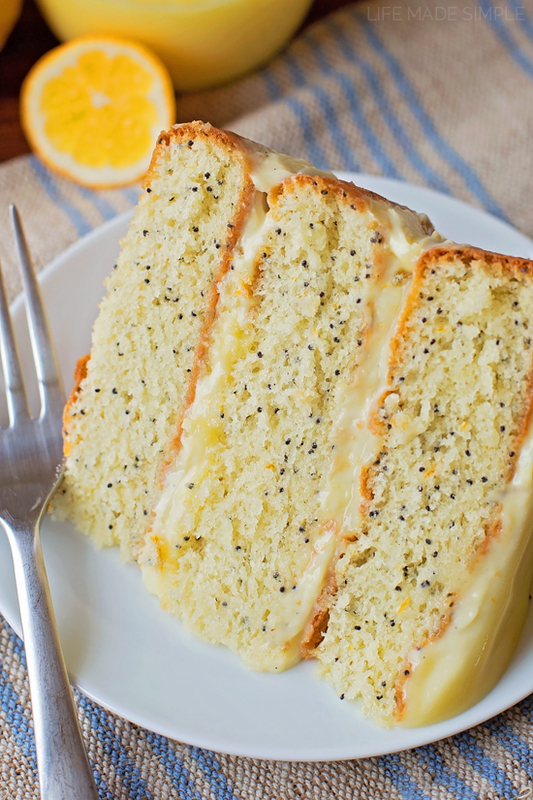 This luscious, lemon poppy seed layer cake is filled with sweet lemon curd and a delicious pastry cream. You’ll be whipping this up all spring long! The first time I made this cake I had some help from my mom. She made the lemon curd and pastry cream for me, which was really nice because the “filling” was done and all I needed to do was bake the layers. The second time I made the cake it was all me, and while it’s all totally worth it, I will admit it does take a bit of planning. To start, you’ll want to make the lemon curd. This is a quick & easy method that I just love! I used the juice and zest of meyer lemons and let me tell you, it was AMAZING! I guess I’ve always had really egg-heavy versions and nothing sweet like this. All I can say is that I’d eat this lemon curd on just about anything. It’s divine. ???? Once the lemon curd is done, tuck it away in the refrigerator to set/chill while you whip up the pastry cream. I absolutely adore homemade pastry cream. I made it a while back for eclairs and have wanted to make it again ever since. This time around I added lemon juice and lemon zest to give it a nice kick (again, using meyer lemons). You can decide whether to use vanilla extract or vanilla bean paste to flavor it, I chose the later. Cover the pastry cream and chill while you prepare the cake. Let’s talk about the cake, shall we? 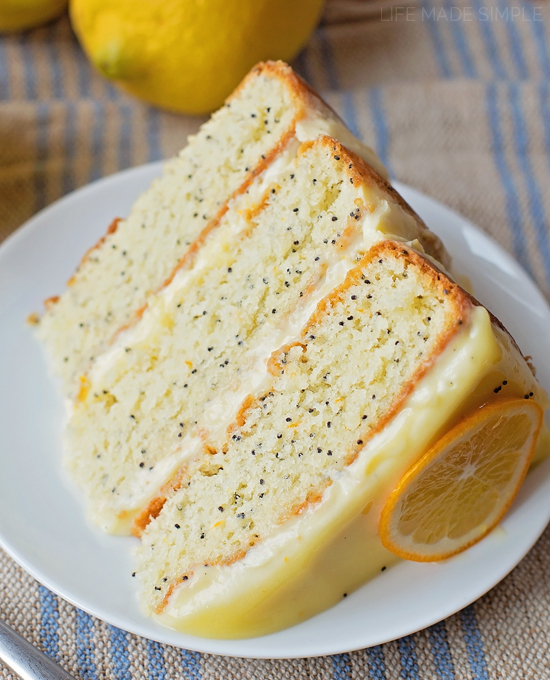 It’s pretty much the moistest, fluffiest, most lemony cake I’ve ever had. It all starts with creaming the butter and sugar for 5 minutes. Yes, 5 whole minutes. I used my stand mixer, but a hand one will do too, just be patient. Add in the remaining ingredients, then fold in the whipped egg whites. This will give the cake that light, airy texture we all love. Divide the batter between three round 9-inch pans and bake until golden brown on top, about 20-25 minutes. 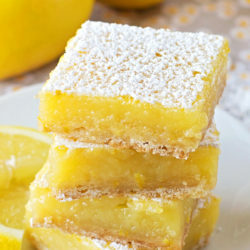 When the cakes have completely cooled, assemble the cake by placing one layer of cake onto a platter or cake stand, then topping with 1/3 of the pastry cream and lemon curd. Continue with the remaining ingredients, then take a spatula or knife and drag any that squished out between the layers onto the “crust” of the cake. It’ll create a nice glaze on the outside, which means this cake is frosting-free. And trust me, you won’t miss it one bit! 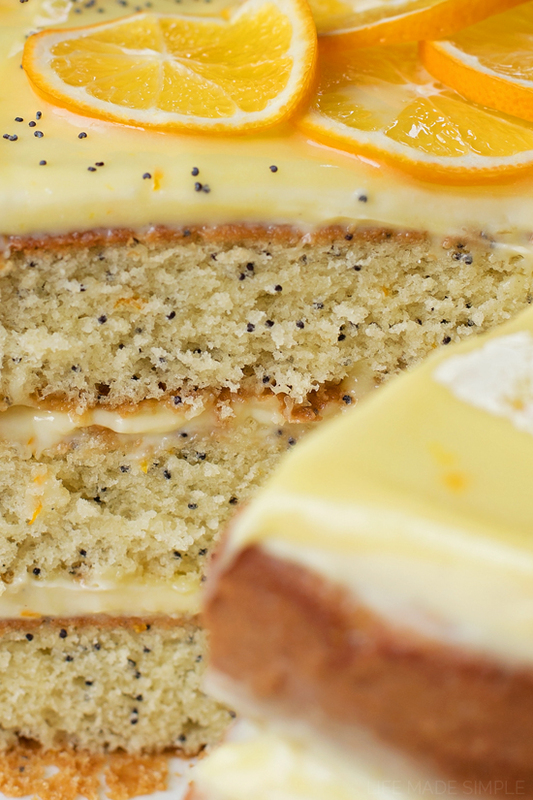 Garnish with slices of lemon, sprinkle of poppy seeds and a few sprigs of mint. Chill for 30 minutes to 1 hour before slicing and serving. I’d highly recommend making this cake for any springtime special occasion It’s seriously perfect!! 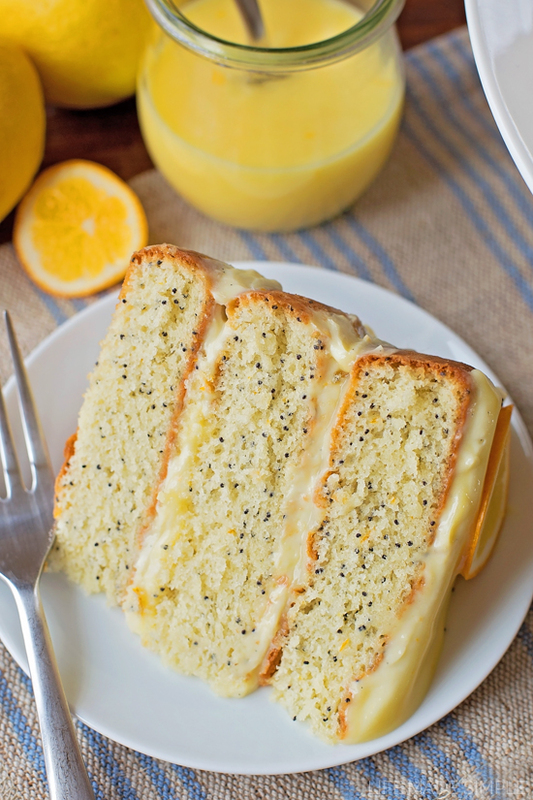 This luscious, lemon poppy seed layer cake is filled with sweet lemon curd and a delicious pastry cream. You'll be whipping this up all spring long! For the lemon curd: In a medium, heavy-bottom saucepan, whisk together lemon juice, zest, sugar and eggs, set over low heat. Add the butter and continue whisking until it melts. Let the mixture cook until it thickens, about 8 minutes, then turn heat up to medium-high and continue cooking for 2-4 minutes or until it reaches a temperature of 160 degrees. Transfer to a bowl, place a piece of plastic wrap directly on the surface of the curd and refrigerate. For the pastry cream: Place mesh strainer over medium bowl; set aside. In separate medium bowl, whisk together the egg yolks, sugar, cornstarch, flour and salt; set aside. Place half and half and in a medium saucepan. Set over medium heat, stirring occasionally just until it bubbles. Gradually pour the hot half and half into egg yolk mixture, whisking vigorously (temper the eggs). Gradually pour the mixture back into the sauce pan. Whisk constantly until the mixture bubbles and thickens. Whisk for an additional minute. Pour the cooked cream into the strainer, whisking to force it through. Whisk in the butter, vanilla, lemon juice and lemon zest into the hot cream. Place a piece of plastic wrap directly on top of cream and refrigerate. For the cake: Preheat oven to 350 degrees. Line the bottom of three 8 or 9-inch pans with parchment paper. In the bowl of a stand mixer, beat the butter and 1 cup of the sugar on medium-high speed until light and fluffy, about 5 minutes. In a medium bowl, whisk together the flour, poppy seeds, baking sodam and salt; set aside. Turn mixing speed to low, add the egg yolks, one at a time, scraping the sides of the bowl after each addition. Add the lemon juice, vanilla, and lemon zest and beat until combined. Gradually alternate adding the dry ingredients and the yogurt, mixing just until combined. In a clean mixing bowl, with a whisk attachment, whip egg whites and remaining cup of sugar until they reach stiff peaks. Fold the meringue into batter until just combined. Divide the batter evenly among the three prepared pans. Place the two pans into the oven and bake for 20-25 minutes or until the tops are golden brown and spring back when touched. DO NOT OVER-BAKE. Bake the final cake layer. Allow the cakes to cool in the pans for 15 minutes, then invert onto wire racks. To assemble the cake: Place one layer of cooled cake onto a platter or cake stand. 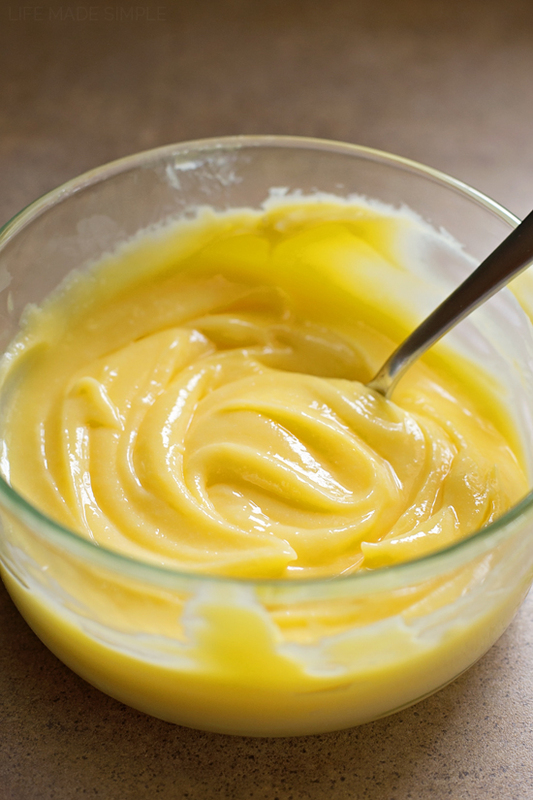 Add spread ⅓ of the pastry cream over top, then ⅓ of the lemon curd. Repeat with the remaining ingredients. Level the top then scrape any excess cream/curd from the sides onto the outer crust of the cake. 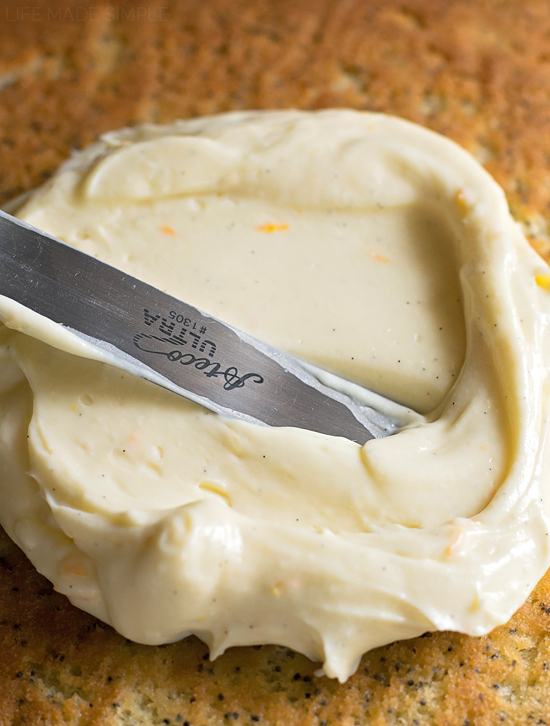 This will create a glaze over it and will give it the look of a "naked" cake, or one that's not completely "frosted." Garnish with slices of meyer lemon, poppy seeds and sprigs of fresh mint, if desired. Place in the refrigerator to chill for 30 minutes to 1 hour before slicing and serving. 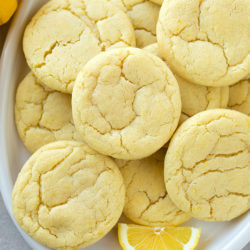 -I used meyer lemons instead of regular lemons for this recipe, because I love the sweetness they add. However, regular lemons can be used. oh yummy! This is right up my alley! Hello. I can’t find half and half where I live, any substitution? 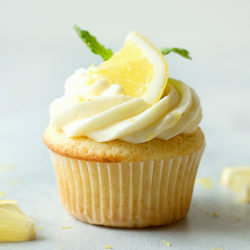 Also I can’t find meyer lemon and I have tried many recipes with regular lemon but I didn’t like the taste. Do you think I can try this with orange? do I need to modify the quantity of sugar? Sorry.. so many questions 🙂 and thank you. Where does the rest of the lemon juice come into play, as the only mention of lemon juice in the directions is for 2 teaspoons of it?? All other lemon curd recipes use .5 c of juice & whisk until curd is thick enough to hold whisk “marks” and 1st bubbles remain. This is a delicious cake recipe, spongy and light, however, making the cake batter, pastry cream and lemon curd sounded like more dishes and work than I wanted to commit to. So… I made the cake as directed, bought a jar of prepared lemon curd (I know it will never be quite a good as homemade), and made homemade butter cream frosting. It was wonderful!! Love that you simplified it- I’m all about that! Hi!, this recipe sounds really really good and I want to try it for my moms birthday… and I was wondering if the cake will hold up if made a day ahead of time. I was just wondering if you can make the sponges ahead of time and freeze them? Obviously without the cream and curd. Hi Chelsea, it’s 2 cups. You will beat the butter with 1 cup and then later in step 8 add the remaining cup to the egg whites. Will the curd and cream be good if I make it one day ahead and then assemble cake next day for serving to my guests? I made this cake for company this weekend, no shortcuts! It turned out fabulous and picture perfect. Everyone loved it. For the Lemon Curd it says 1/2 cup of lemon juice in the measurements but, in the directions it says 1.For the lemon curd: In a medium, heavy-bottom saucepan, whisk together 2 teaspoons lemon juice, zest, sugar and eggs, set over low heat. What happens to the rest of the lemon juice when do you add it? I didn’t see anywhere in the directions thank you. Followed the recipe and it is wonderful!! My new favorite cake. I’ll be making it again. Excellent recipe. Just made this with my almost 11 year old for his birthday cake. 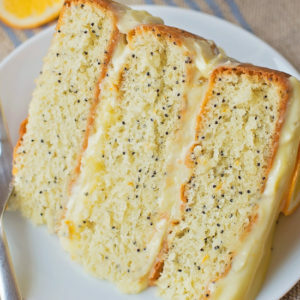 He wanted lemon poppy seed and we chose this one. He had great fun doing most of the work and experimenting for the first time with lemon curd and pastry cream. We served about 20, mostly adults, but several kids as well and everyone loved it, of all ages. Thank you for the thorough explanation. You made his birthday. He was quite proud. Your comment made my day! Thanks for coming back to share Marielle!! hi, do you think this recipe will be able to support fondant icing? I would think so. If you are worried you could always add a dowel or two. I made this yesterday. The lemon curd and pastry cream were delicious. My cake turned out quite dense, though. Can you think of where I might have gone wrong? Could this be a 9×13 cake pan? Hi Karen, I haven’t tried making this in a 9×13-inch pan. Generally you use a 2 layer cake recipe for that size pan. Hope that helps! Loved the recipe and used it to make cupcakes. The middle sank – still tasted fabulous – but I wondered if that was due to the egg wire mixture. Just curious. Mine did as well and I attribute it to my meringue not being whipped stiff enough. So the batter was too wet. I have baked this earlier today. It tastes great. I reduced the lemon curd a bit and I used sour cream instead if greek yogurt. Thank you for sharing this recipe! !